iamafeeder.net » Happy (Belated) Blogoversary To Me + Give-Away Winners! Happy (Belated) Blogoversary To Me + Give-Away Winners! So I Am A Feeder is one. That went quickly, didn’t it? And can you believe it’s only been a year? I feel like I’ve been doing this my whole life! In fact, it went so quickly I even forgot to celebrate it on the 21st April! Doh. Originally this post was going to be about what a failure I’ve been in the kitchen lately. I was going to tell you how I’ve nearly fainted in public twice in the past month because I keep forgetting to eat (massive fail! ), how I burned my arm on both the rim of my angel food cake tin when I was taking the monkey bread out and the molten sugar that dripped onto me afterwards, how despite the fact that I made it twice I still couldn’t get it right, and how I forgot to take photos of most of it anyway… but I decided that when birthdays come around it’s better to celebrate the good than the bad, and to remember that every experience is an opportunity to learn. So happy blogoversary to me! Birthdays deserve cakes, do they not? And food blog birthdays even more so. I spotted this New York style cheesecake over at Smitten Kitchen a while ago and had resolved to make it. 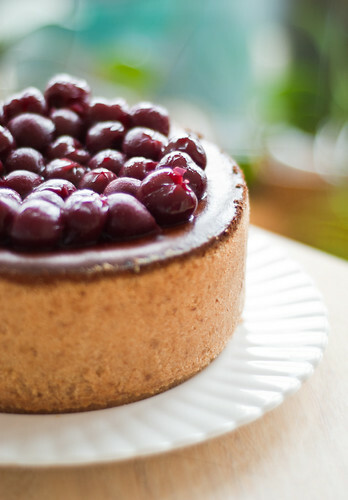 New York cheesecakes are slightly different in that you bake it at a very high temperature to begin with and then lower it to cook the cheesecake through. The first time I made this for some crazy reason I converted the fahrenheit to celsius for the first temperature but then not the second, which meant that I continued to cook my cheesecake at a very high temperature for forty minutes – error. I tried to salvage it but had even worse results and ended up with a complete cheesecake failure on my hands, so into the bin it went. 1. Make crumb crust: stir together the crust ingredients and press into the tin up to an inch below the top. Stick into the freezer whilst you prepare the filling. 2. 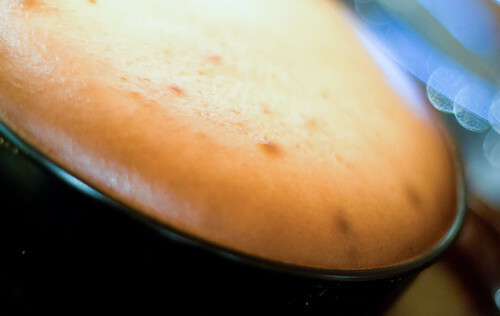 Make cheesecake filling: preheat the oven to 285 degrees C.
3. Beat together the cream cheese, sugar, flour and zest with electric beaters until smooth. 4. Add vanilla, eggs and yolks, one at a time, beating on low speed to incorporate. Scrape the bowl down between additions with a spatula. 5. Place the crust tin in a shallow baking tray and pour in the cheesecake filling. Bake in the middle of the oven for 12-15 mins until puffed. 6. Reduce the temperature to 90 degrees C and continue baking until cake is mostly firm and center is still slightly wobbly when shaken gently, for 1 hr or so. Keep an eye on it. 7. Run a knife around the top edge of the cake to loosen, then cool completely in the springform on a rack. Chill in the fridge, loosely covered, overnight. 8. Make the cherry topping (optional): place all ingredients together in a medium saucepan. Bring to a boil. Once it is boiling, cook it for an additional one to two minutes then remove from heat. Cool completely. 9. Remove cake from springform onto a plate (I found it useful to open remove the sides, turn the cheesecake upside down onto a plate, remove the metal base of the springform, then invert again onto another plate). 10. Spread topping (if using) over chilled cheesecake. Dig in! “I was asked to bring a cheesecake to a party, because I am well-known amongst my friends for being good with cheesecake (uh, usually). I decided at the last minute though to adapt my usual NY-style cheesecake recipe to a honeycomb baked cheesecake, I did this by just adding honeycomb to the recipe. Disaster number 1: the honeycomb, of course, melted, leaving the mixture considerably more liquid than usual. After the standard 2 hours baking time it had not set. Not even a little bit. Seriously… not at all, liquid cheesecake. It was, by this time, approximately midnight. I set my timer for another hour and returned to the TV. An hour later… better, encouraging signs of setting around the edges, but still not cooked. Oy-vey. Nice one guys! Please email me your details & I’ll get your prizes sent out to you! Congrats! And so that’s what I’ve got for you today. The only thing that remains then is to say thank you all for coming by my blog, repeatedly or for the first time, thank you for leaving comments, thank you for supporting me, thank you for the friends I’ve made over this year, thank you, thank you, thank you. One year down, many more to go! Now go eat some cheesecake. This post was no. 3 in the Top 9 on Foodbuzz on 3rd May, 2011! Thanks! what a gorgeous cheesecake to celebrate your blogaversary with !!!! I am so sorry we missed it. We have been blessed with your presence in our community, here is wishing you many many more years of blogging with us! Congrats on a successful first year, I look forward to reading for many, many more! I, for one, am thrilled to have found your blog. Through your site it’s given me the wonderful opportunity to meet you in person and get to know you. Big congrats for an awesome first year in blog land. Your talents, generosity, kindness, and all around awesomeness are great to have and see in this crazy world. Thanks for sharing your world with all of us. Cheers to what lies ahead! hey jackie…quit forgetting to eat or I will have to slap you, woman! Unacceptable. I have mis-converted recipes so many times! Your second attempt looks gorgeous! Jackie: you are such a wonderful addition to the blogging community: I have enjoyed your fun spirit and tremendous energy: congrats on a year of fun and success…and many moooooore!!! congrats on the top 9 and congrats on your blogoversary! Beautiful cheesecake. Congrats on 1yr and Top 9! Happy blogoversary and congrats on top 9! The cheesecake looks wonderful! New york cheesecake is a secret favorite of mine. I rarely make it, but when I do it’s all gone with in a few days. Congrats to the winners of the giveaway as well! You’ve gone all out to celebrate! So proud of Mr. Nom Nom and you. Btw, I’m missing him. Where is he lately? this looks delicious!!! congrats on top 9 + happy blog anniversary! Yummy! 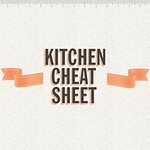 Just found your wonderful blog on foodbuzz & am your newest follower!